SHARMINI PERIES: It’s the Real News Network. I’m Sharmini Peries coming to you from Baltimore.John Bolton was recently appointed President Trump’s national security adviser, replacing Gen. McMaster. 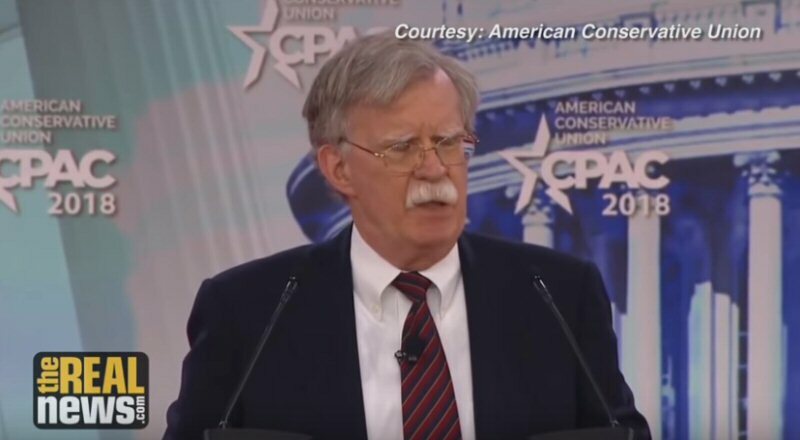 Bolton’s appointment has been so controversial that there has been a great deal of international outrage because of his history at the United Nations when he served as the U.S. ambassador to the U.N. under George W. Bush and under Secretary of State Condoleezza Rice. The specific case I’m talking about here is July of 2006, wherein Israel invaded Lebanon, starting a war that lasted over a month, claiming the lives of over a thousand Lebanese, 120 Israelis, and 50 foreign nationals. According to an interview with Danny Gillerman, the Israeli ambassador to the U.N. at the time, the French government tried to bring a resolution to the Security Council to stop the war. And then-Secretary of State Condoleezza Rice had actually approved it. Ambassador Danny Gillerman says that Bolton approached him, revealed that Rice intends to support the resolution, and ask him to intervene by calling the Israeli Prime Minister, Ehud Olmert at the time, and have Olmert call President Bush and put pressure on him to block the French resolution to stop the war. This fact is now also confirmed in the memoirs of former Israeli Prime Minister Ehud Olmert, which was recently published.Now joining me to discuss all of this is Phyllis Bennis. She’s a fellow and director of the New Internationalism Project at the Institute for Policy Studies in Washington, D.C. She’s the author of many books, including “Understanding the Palestinian-Israeli conflict: A Primer.” Thanks for joining me, Phyllis. PHYLLIS BENNIS: Always good to be with you, Sharmini. SHARMINI PERIES: All right. Phyllis, take us back to the situation in 2006. Why did Israel invade Lebanon, and why was it so difficult to reach a cease fire, and what was Bolton’s involvement in all of this? PHYLLIS BENNIS: This was a very complicated situation that had to do with Hezbollah, accusations that Hezbollah had crossed the Israeli border. There was a border skirmish that had gone on. It was an Israeli choice to escalate what could have been deescalated. Instead they chose to make it, essentially, a full-scale war. It was a very difficult thing to figure out terms for a cease fire partly because Hezbollah, which was a, an organization that had been established back in 1982 to challenge the then Israeli occupation of southern Lebanon, was now a major part of political life in Lebanon. It a major political party with a significant status in the, in the Parliament, and it had its own militia. And the question of the relationship between Hezbollah and the Lebanese army, between the Hezbollah party and the Lebanese state, all of that was very complicated.So the U.N. has been involved with trying to figure out a ceasefire because the humanitarian consequences were quite devastating, obviously first on on the Lebanese side. Because Israel and Lebanon did not have diplomatic relations, didn’t really have the capacity to engage each other directly, the U.S. was sitting in as Israel’s representative. France was essentially representing Lebanon. So there were a lot of negotiations underway between the U.S. and France, and then they would each go back to their respective junior partner, if you will, to get approval.Fast forward to this issue that emerged with Bolton, and what happens is in the early evening, around 8:00 in the evening, this is just a night or two before the final ceasefire resolution is passed, Gillerman, who is the Israeli ambassador in New York, gets a call from his longstanding friend John Bolton. John Bolton at the time was the U.S. ambassador to the United Nations. And he calls Gillerman and says, listen, I’ve got to see you. Not in your house, sorry, not in your office or in my office. Let me come to your house.So Bolton goes to the house, the home of the Israeli ambassador, clearly indicating he did not want to be overheard, including by his own supervisor. That was when Condoleezza Rice was at the time the secretary of state, she was supposed to be Bolton’s supervisor. She confirmed this letter and said he had no permission to do this. He goes to meet with Gillerman and says, listen, there’s been a glitch here and Condoleezza Rice is about to put forward a resolution that the French have approved, and that means Lebanon has approved it. And he actually says that Condoleezza Rice has sold you out to the French. And what you need to do, this is now the U.S. Ambassador John Bolton saying to the Israeli ambassador, what you need to do is to call the president of Israel and have him call President Bush and stop this from happening. And the response from the ambassador is it’s 3:00 in the morning in Israel. He says, this is important. You’ve got to do this. He goes ahead and does this.Now the reason we know all this detail is because just a couple of days ago Gillerman gave an interview to the Israeli radio which was then transcribed, translated into English, and has been bouncing all around the world with all of this detail. So what happens here, Gillerman is doing his interview on Israeli radio. And when he tells this whole story the interviewer kind of can’t believe it. And he says to Gillerman, wait a second. What you’re saying is the State Department under Condoleezza Rice had advanced something against Israel, and the U.S. ambassador to the U.N. John Bolton calls you, meaning the ambassador to Israel, and says listen, wake up Olmert, the president of Israel, so he will talk to Bush to stop her to stop Condoleezza Rice? And Gillerman answers, exactly.That’s why this whole thing is such an extraordinary level of information. John Bolton, who was the U.S. ambassador, was acting as an agent, as an asset for Israel against the interests of his own secretary of state, his own State Department, his own superiors, and his own president. It was quite extraordinary. It went back, if we look this is not the first time that Bolton was seen as a as a major asset for Israel. If you go back to the period shortly before this, at this time Bolton as the U.N. ambassador had been appointed by President Bush on what is known as a recess appointment. That’s what happens when the president knows he can’t get the Senate to confirm an official position. The position of U.N. ambassador has to be confirmed by the Senate. And there was so much opposition to Bolton in the Senate that he knew he couldn’t get it. So when that failed he gave Bolton this temporary assignment as a recess assignment, which lasted just over a year.But during the time that the Senate was debating how to deal with Bolton there were hearings going on, there was enormous opposition. But one very influential senator, that being the senator from New York, Charles Schumer, turned out to be a great supporter of John Bolton. And Steve Clemons, who’s the editor of Washington Note, a very well-informed insider journalist, has written lately what he had heard back then, where Schumer had launched what Clemons called a passionate personal campaign to help Bolton succeed. And in that context Schumer had actually called a number of Democratic Senate colleagues who were opposed to this far-right pro-war Republican John Bolton, and said to his Democratic colleagues, a vote against John Bolton is a vote against Israel. It was extraordinary. He was going against the interests, in this case, of his own party, supporting someone who had been one of the great architects of the war in Iraq, and saying if you vote against this guy you’re voting against Israel.So this has been an extraordinary moment of exposé of Bolton’s actual accountability being far greater to the interests of Israel than to the interests of his own government. SHARMINI PERIES: Now, Phyllis, given this kind of history with Bolton, and now he’s inside the White House where we are actually dealing with the possibility of isolating Iran in the region and going into a situation where the nuclear agreement with Iran is going to be unraveled, and given this history what kind of advice do you expect that he would be giving Trump at this time? PHYLLIS BENNIS: Well, this is a very dangerous moment, Sharmini. As you say, there is a great deal of fear, I think all over the world, frankly, and certainly here in the United States, certainly in Iran, certainly among the other six partners of the U.S. who signed the Iran nuclear deal back in 2015, that come May 12th, which is the deadline day when Trump has to either recertify that Iran is in fact abiding by the terms of the agreement something that the International Atomic Energy Agency and all independent observers have agreed it is abiding by the terms. They either have to do that or say they’re no longer abiding by the terms and we’re going to reimpose those nuclear-based sanctions that were lifted in the context of the agreement. If that happens, all bets are off. It essentially tells Iran we’re out of here, the agreement is no more, and gives them the right to go ahead and restart the effort to rebuild their nuclear power program, including enriching uranium.Now, the Iranians may choose not to do that, but it would be an incredibly dangerous moment. And what we know about John Bolton is that he has been advocating for not only preventing the Iran nuclear deal, he tried very hard to stop it, as did the Israeli Prime Minister Benjamin Netanyahu, who as you remember back in 2015 was invited to address a joint session of Congress, came here to the Congress, addressed the Congress in the Capitol as if it was his house, if you will. As if he was making a State of the Union address. And urged members of Congress in our country to vote against their president, who was urging them to support the Iran nuclear deal. It was an outrageous display of disdain for U.S. sovereignty, if you will. And we know from the former minister of defense in Israel, Shaul Mofaz, that Bolton had pressured him as well in the past. There was an interesting quote from Mofaz just in the last day or two when he said, I have known John Bolton ever since he was the U.S. ambassador to the United Nations. He tried to convince me that Israel should strike Iran.So here’s John Bolton as the U.S. ambassador trying to pressure the, the secretary of defense, the minister of defense of Israel, that Israel should be attacking Iran. It’s the height of violation of any sort of accountability to his own chain of command, to his own president, to his own secretary of state, to his own State Department.So clearly Bolton views his own position of saying that we should be attacking Iran, we should end the nuclear deal, we should bomb Iran. Very reminiscent of the old John McCain line, bomb bomb bomb, bomb bomb Iran. All very clever. And this is exactly what John Bolton is now saying, that we should bomb Iran. He’s telling Israel they should bomb Iran. And that the Iran nuclear deal that has worked so powerfully for the last three years should be abandoned. This is very, very dangerous because we know that will be the advice that John Bolton is giving to President Trump. SHARMINI PERIES: All right, Phyllis. We’ll leave it there for now, but a lot more to pursue in terms of what the, Donald Trump’s security adviser is going to be telling him in the coming days and months. So I thank you so much for joining us today.